A playful variation on Tuscany's classic grape-studded flatbread, featuring espresso-poached pears as the filling and a warm chocolate-espresso sauce as embellishment. Make the dough: Combine the flour, yeast, salt, vanilla, sugar, and olive oil in a food processor. Add enough warm (100°) water to form a soft dough with the motor running. Process 45 seconds. Turn out into an oiled bowl; cover and let rise at room temperature until doubled, about 2 hours. Meanwhile, make the pears: Bring the water, the espresso, sugar, and cinnamon stick to a boil in a wide pan; cook for 10 minutes. Drop in the pears; cook 15 minutes, or until tender when pierced with a knife. Remove to a plate, cool, cut into slices, and set aside. Make the sauce: Strain the pear cooking liquid, reduce it to ½ cup, and whisk in the chocolate until melted and smooth; set aside. Bake the focaccia: Turn the risen dough out onto a lightly floured counter. Roll out into a long rectangle; lightly oil a baking sheet and drape the dough over it, leaving half of it hanging over the sides of the baking sheet. Scatter the pears over the dough, drizzle with 2 tablespoons of the olive oil, and sprinkle with ¼ cup of the sugar. Bring the overhanging dough up to enclose the filling; seal the edges by pressing with your fingers. Drizzle the top with the remaining 2 tablespoons of olive oil and sprinkle with the remaining ¼ cup of sugar. Let rise for 45 minutes. Meanwhile, preheat the oven to 400°. Bake the focaccia for 30 minutes, or until golden and set. 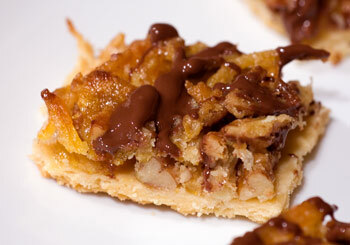 This unusual Tuscan tart is not overly sweet, but sweet enough to serve for dessert with a glass of Vin Santo. Make the filling: Place the rice, milk, 2 tablespoons of the sugar, and 1/8 teaspoon of the salt in a 1 quart pot and bring to a boil. Cook over medium-low heat, uncovered, until the rice is soft and has absorbed the milk, about 30 minutes. Cool. Meanwhile, soak the raisins in the rum for 30 minutes. Bring 4 quarts of water to a boil. Drop in the Swiss chard and cook 10 minutes. Drain, rinse under cool water, squeeze dry, and chop coarsely. Mix with the rice, egg yolks, Parmigiano, pine nuts, lemon zest, nutmeg, the raisins with their soaking liquid, the pepper, and the remaining 1/3 cup sugar and 1/8 teaspoon salt in a large bowl; refrigerate 2 hours. Make the dough: Process the flour, sugar, salt, lemon zest, vanilla, and butter in a food processor with quick pulses until the ingredients resemble coarse meal. Add the egg and process again, with quick pulses, until a dough forms. Turn out onto a counter, gather into a ball, and shape into a flat disk. Wrap and refrigerate 30 minutes to 2 hours. Roll out the dough on a lightly floured counter until it is 1/8 inch thick. Line a buttered 9-inch fluted springform pie pan with it, cut off excess dough, and spoon in the filling. Level the filling with a spatula. Bake in the preheated oven for 40 minutes, or until the crust is golden and the filling is set. We sampled this delicious and healthy dessert at a Greek restaurant in Astoria, Queens, with our Cyprus-born Wine Director, Costas Mouzouras of Gotham Wines & Liquors. 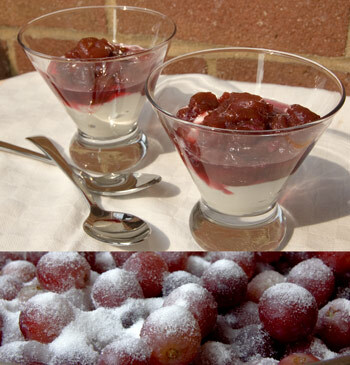 Greek yogurt is essential to the success of this dish; so are sweet, firm, seedless red grapes. If reading this recipe doesn't inspire you to run into the kitchen, let me assure you that this is one of the best desserts I have sampled in years... and one of the easiest. Serve it in Martini glasses or pretty wine goblets for an elegant presentation. Make the grapes: Place all the ingredients in a medium saucepan. Cook over a medium-high heat until the grapes start to break down and the cooking juices thicken and reduce, about 35 minutes, stirring often. At first, the grapes will let out a lot of liquid; the longer you cook them, the thicker the liquid will become. The grapes are done when the liquid is fairly thick (it should almost coat the back of a spoon) and the grapes are soft but not mushy. Taste and add more sugar if needed. Cool to room temperature. 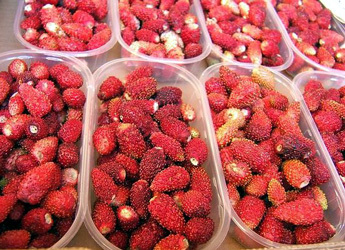 The grapes can be made 3 days ahead and refrigerated. Return to room temperature before serving. 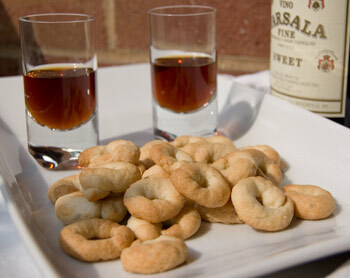 Taralli are a favorite in southern and central Italy: crisp little biscotti shaped like a spiral with overlapping ends, they are made in both salty and sweet incarnations. The sweet version I like best features anise and white wine, and isn't overly sugary, so it pairs beautifully with a glass of sweet Marsala at meal's end. Preheat the oven to 375 degrees. Line 3 baking sheets with parchment paper. Sift the flour and baking powder together onto a counter. Add the sugar and anise seeds and mix well. Add the wine and olive oil, and knead gently until a dough forms. If a dough does not form, knead more vigorously. Depending on the protein content of your flour, you may need to add a little more wine if the dough is dry or a little more flour if the dough is sticky. 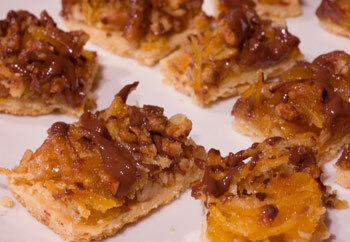 Cut into walnut-sized pieces. Roll each piece into a tight ball in the palms of your hands, then roll each ball into a thin log (about 1/8-inch thick) on an unfloured counter. Shape each log into a spiral with overlapping ends. Make the dough: Place the potato in a small pot and cover with cool water. Bring to a boil and cook until tender, about 15 minutes. Drain and cool, then peel and pass through a ricer into a bowl. Cool to room temperature. Add the riced potato or instant mashed potato flakes and pulse again to combine. With the motor running, pour in the buttermilk until a smooth, supple dough forms. You may need to add a little more flour if the dough is wet or a little more buttermilk if the dough is dry. The dough should be moist, slightly tacky, but not sticky. Process a total of 45 seconds after it forms a ball. Shape the dough: Turn the dough out onto an unfloured counter; it is a rich dough and will not stick. Pat it out or roll it into a 12 inch x 8 inch rectangle. Make the filling: Combine the cinnamon, flour, and granulated sugar in a bowl. Set aside. Brush the dough with the buttermilk. Sprinkle evenly with the cinnamon-sugar mixture. Roll the dough lengthwise into a tight, even roll; as you roll it, use your hands to gently stretch it out. It should measure about 20 inches in length once rolled. Using a sharp serrated knife, cut into 9 even rounds. Butter a 9-inch round glass baking dish. 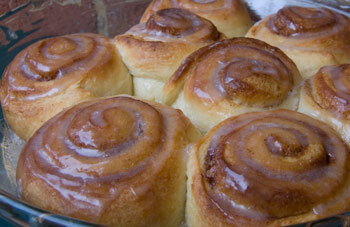 Place the dough rolls in the dish, spacing them apart evenly. Gently press on each roll with the palm of your hand to flatten slightly. Cover the baking dish with plastic wrap and set aside at room temperature to rise until puffed and almost doubled in volume, about 1 hour. Thirty minutes before baking, preheat the oven to 375 degrees. Uncover the baking dish and bake the rolls in the preheated oven for 25 minutes, rotating the dish once to ensure even cooking. The rolls should be a light golden brown on top but still pale on the undersides (if they darken too much, they will be dry rather than moist; do not overbake these rolls). Meanwhile, make the icing: Combine all the ingredients in a small bowl. If the icing is not spreadable, add more buttermilk by the teaspoon as needed. A luscious, dense cake flavored intensely with almond paste. 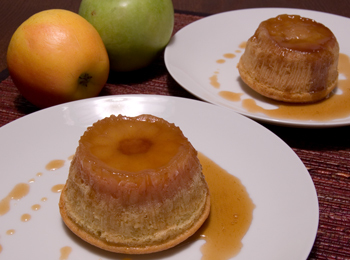 Make the apples and syrup: Preheat the oven to 325 degrees (preferably set on convection). Combine the Marsala and sugar in a 10-inch skillet over medium heat. Bring to a boil and cook 2 minutes, or until the sugar is dissolved. 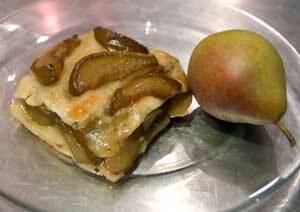 Add the apple slices in a single layer and cover. Cook until the apple is tender all the way through but still holding its shape, about 15 minutes, turning once. Spray 10 small (1/2-cup capacity) cake pans with the nonstick spray. Place the cake pans on a baking sheet. Place 1 apple slice (reserve the syrup in the skillet) in each of the 10 greased cake pans; press to make sure the apple slices sink to the bottom. Meanwhile, make the batter: In a small bowl, combine the flour and baking powder. In an electric mixer fitted with the paddle attachment, beat the butter, almond paste, and sugar until the sugar is no longer visible and the mixture is fluffy, about 3 minutes on medium speed. Beat in the eggs one at a time, then the vanilla extract, and finally the flour and baking powder mixture. Do not overbeat or the cakes will be tough. Spoon the batter into the prepared cake pans and tap on the counter to eliminate air bubbles. Bake in the preheated oven for 20 minutes, or until a toothpick inserted in the middle comes out clean. Cool 5 minutes, then loosen the edges with a knife. While the cakes are still warm, unmold them upside down onto 10 plates. 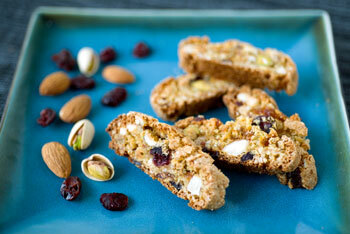 A healthy dose of lemon zest gives these biscotti a delightfully refreshing aroma. Preheat the oven to 350° (preferably set on convection bake). Coarsely chop the almonds in a food processor; do not overprocess the almonds: they should be the size of large peas (if they are ground rather than chopped, the batter will be too dry and will require additional eggs to come together). Turn the almonds out into a bowl. Add the pistachios, apricots, cranberries, flour, sugar, lemon zest, baking powder, and salt, and mix well to combine. In a small bowl, beat the eggs with the lemon oil. 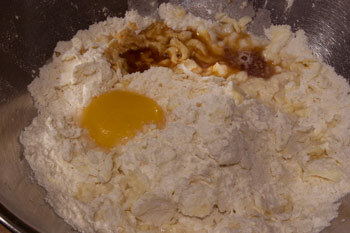 Pour the egg mixture into the flour mixture and stir with a fork until a dough just starts to come together. Gather the dough with your hands, squeezing and kneading it firmly to help it form a solid mass. Turn the dough out onto a counter, gather into a tight ball, and cut into 4 equal pieces. (If the dough sticks to the counter, sprinkle the counter with a bit of sugar, not flour.) Shape each piece into a 1-inch wide log and place the logs, 2 inches apart, on 2 parchment paper-lined 11-inch x 17-inch baking sheets. Bake 25 minutes, or until lightly golden and just set. Remove to a cooling rack, cool 5 minutes, and cut into 1/4-inch thick slices on the diagonal. Arrange the slices in a single layer on the same parchment paper-lined baking sheets. Return to the oven and bake 5 minutes, or until golden; the biscotti should not be fully crisp. Look for Italian gelato in specialty shops and well-stocked supermarkets; or simply select your favorite vanilla bean ice cream. Either way, this dessert is the true essence of summer. 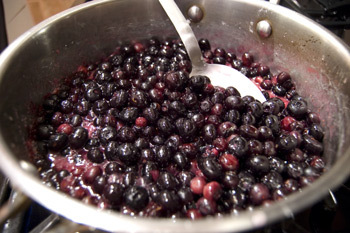 Make the blueberries: Place all the ingredients in a medium saucepan. Cook over a medium heat until the blueberries pop and start to break down and the cooking juices thicken and reduce, about 12 minutes, stirring often. Taste and add more sugar if needed. The simplest of all desserts, and my husband's favorite summer treat. 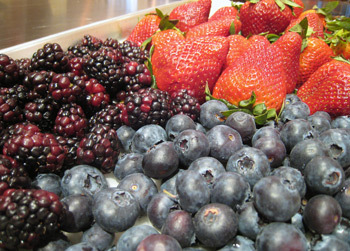 You can serve the berries over lemon sorbet if you like, or try lime instead of lemon juice for a sweeter flavor. Toss all the ingredients together in a bowl and allow to macerate for 15 minutes at room temperature. Extra-virgin olive oil lends a delicious fruitiness to the delicate yeasted dough for this focaccia. 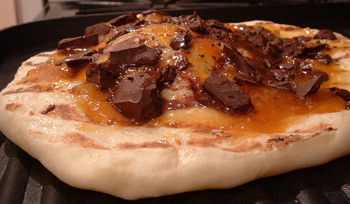 I often grill the focaccia dough instead of baking it (see picture) and top it with the almonds, apricot jam, and chocolate after removing it from the grill. For more on working with yeast, click here. Place the risen dough in a generously oiled 14-inch round pizza pan (copper works best, since it conducts the heat much more quickly). Push it with your fingers until it extends to the sides of the pan (you might need to wait 5 minutes for the dough to stretch more easily). Make the topping: Pour the olive oil evenly over the focaccia and spread it with your hands all over the dough. Sprinkle the focaccia with 2 tablespoons of the sugar and dimple the top of the focaccia vigorously with your fingers. Scatter the almonds over the focaccia and press with your fingers to make them sink into the dough. Spoon little mounds of jam all over the focaccia. Dimple the focaccia a second time, helping the ingredients to spread as you do so. Let rise at room temperature for 45 minutes. Meanwhile, preheat the oven to 475°. Prosecco di Valdobbiadene, a sparkling wine obtained from the prolific and prized Prosecco grape in the Veneto, is one of Italy's great oenological offerings. Here it refreshes the palate in a colorful berry salad… Serve as alight dessert in pretty goblets, perhaps topped wiitha dollop of Mascarpone or vanilla gelato. 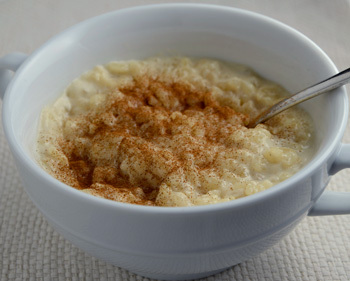 This is the rice pudding my grandmother made when I was growing up. Be sure to cook the rice slowly, so it becomes deliciously tender and creamy. Avoid refrigerating the pudding, as the rice will become unpleasantly chewy. Place the milk, sugar, and cinnamon stick in a 2-quart pot. Set over medium heat and warm until the sugar dissolves and the milk is almost boiling, stirring often. Stir in the rice and lower the heat to low. Cook, covered but with the lid slightly askew, for 1 hour, or until the rice has absorbed almost all the milk and is very tender to the bite; be sure to stir often, as this will promote the starch from the rice to thicken the milk further. Taste for sugar and add a bit more if desired. If the rice is fully cooked and there is still milk in the pan, cook uncovered until the milk reduces to your liking. If the rice is not fully cooked and soft by the time most of the milk has been absorbed, add more milk as needed to finish cooking the rice to the correct consistency. Cut the panettone into 1/2-inch cubes (they will be roughly crouton-sized) and divide half of the panettone cubes evenly among 8 wine glasses. Drizzle the panettone cubes with 2 tablespoons of the chocolate liqueur. 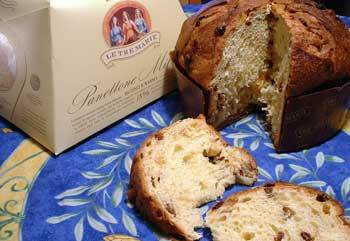 The panettone will not be soaked in liqueur; it is sufficiently moist and flavorful to require just a hint of liqueur. 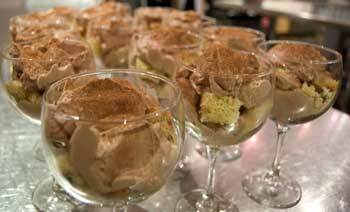 If you pour on too much liqueur, the resulting tiramisu will be too strong and also too moist. Using an electric mixer, beat the Mascarpone with the sugar until perfectly homogenous. Add the cooled melted chocolate and espresso and whisk until smooth. In another bowl, beat the heavy cream until soft peaks form. 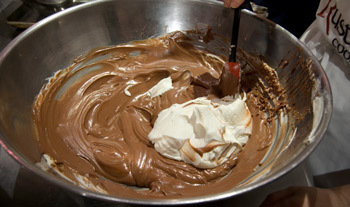 Fold into the Mascarpone-chocolate mixture, being careful not to deflate it. 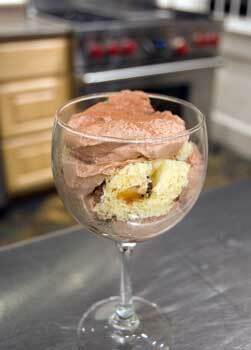 Top the panettone cubes in the goblets with half of the Mascarpone-chocolate mixture. Dust the Mascarpone-chocolate mixture with half of the cocoa. Repeat, making a second layer with panettone cubes, chocolate liqueur, and Mascarpone-chocolate mixture. Finish with a dusting of cocoa. Refrigerate the tiramisu up to 24 hours and serve chilled. 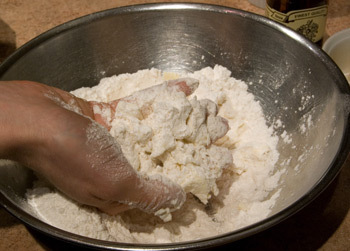 Make the dough: Place the flour and sugar in a large bowl and mix well with your fingers. Add the chilled butter and rub the ingredients together quickly with your fingertips until the mixture resembles coarse meal; do not overmix or work the dough for too long or the butter will melt and the dough will not be flaky after baking. Be sure the butter is very cold before you start mixing it into the flour for this same reason. It is essential that the butter simply be coated with the flour rather than fully incorporated with it. Add the egg yolk and vanilla extract to the butter and flour mixture and knead quickly to incorporate the wet ingredients into the dry ingredients. It is very important not to let the butter melt at this point either, so work fast. The dough will feel soft and just slightly sticky; it should not be dry or crumbly. If the dough feels dry, add a little more ice water, but don't overdo it or the dough will become too soft to roll out properly. Shape the dough into a rough rectangle and place it between two large sheets of plastic wrap. It will be a lot easier to roll out the dough immediately between the sheets of plastic wrap rather than attempting to roll it out directly on the counter. Also, by rolling the dough between sheets of plastic wrap, you can avoid using flour to prevent sticking--which means your dough will come out more delicate, less heavy than if you rolled it directly on the counter. Using a rolling pin, roll the dough out into a thin rectangle--about 1/8-inch thick. It will measure about 12 inches by 10 inches. 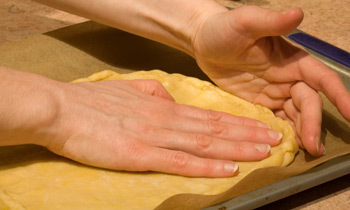 Don't worry if the dough does not form a perfect rectangle; you can fix it with your hands later. Place the dough rectangle on the parchment paper-lined baking sheet and discard the plastic wrap. Use your hands to perfect the rectangle shape and to create a thin border all around the dough; the border will prevent the topping from leaking as it bakes later on. The dough can be baked immediately or refrigerated for up to 12 hours before baking. Bake in the preheated oven 12 minutes, or until just set and barely golden. 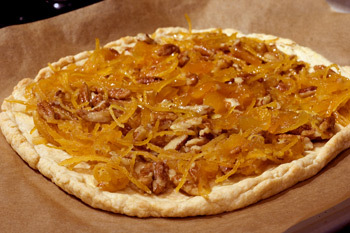 Make the topping: Place the julienned orange peel with 2 cups of the water in a small pan. Bring to a vigorous boil over high heat and boil 10 seconds, then drain and rinse thoroughly. 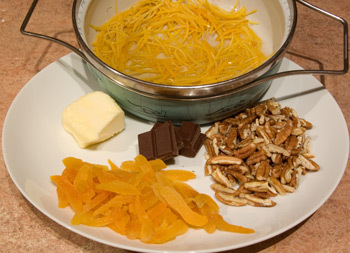 The purpose of this step is to rid the orange peel of its bitter taste and to soften it slightly before it is further cooked. Rinse the pan in which you cooked the orange peel. 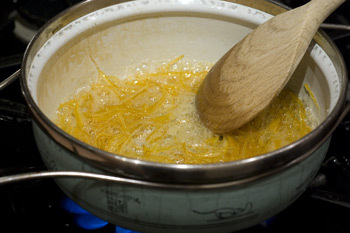 Return the blanched orange peel to the pan and add the remaining 1/2 cup of water and the sugar to the pan. Bring the mixture to a gentle boil and cook, uncovered and stirring once in a while, for about 5 minutes, or until the liquid in the pan reduces to a thick glaze and the orange peel is soft. Don't cook the orange peel too long or it will become too hard as the sugar caramelizes. Add the heavy cream to the pan with the orange peel; be careful of splattering as the mixture may bubble over. Stir in the butter, the walnuts, and the apricots. The mixture will be quite thick. Remove the topping mixture from the heat immediately, or it will harden as the sugar continues to cook. Pour the warm topping on the part-baked dough and use a rubber spatula to spread it evenly to the edges. 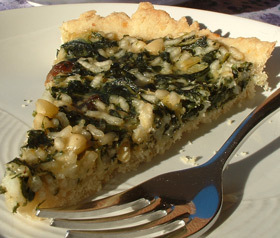 Return to the oven and bake 12 minutes, or until the crust is golden and the topping is lightly browned. If the topping browns too quickly before the crust is golden, cover with a sheet of aluminum foil. Meanwhile, melt the chocolate in a double boiler or in a microwave until just smooth. You can substitute white chocolate for the bittersweet chocolate if you like, or opt for a combination of white and bittersweet chocolate (melted and drizzled separately for color and flavor contrast). Using a teaspoon, drizzle the melted chocolate over the walnut cookies in a pretty zig-zag pattern (if you have a small piping bag, you can use it instead of a spoon). Cool to room temperature.